The period from the acquisition of The Vine and its land by Thomas Foley in 1701 to the middle of the 18th century is unfortunately a completely blank one in the history of the house. However, one consolation is that, in the second half of that century, a number of sources suddenly become available to give us a better picture, during a period of almost 60 years, of the appearance of the house and the identity and activities of its inhabitants than we have had hitherto. It must be quite likely that Thomas Foley had installed his Steward in The Vine immediately upon its acquisition in 1701 – or he may of course have let it to a tenant farmer or even allowed Herbert and Mary Walton to rent it from him for the rest of their lives. Of this, however, we know nothing. Mary Walton’s death is recorded in the Parish Register in 1715, though that of Herbert cannot be traced. 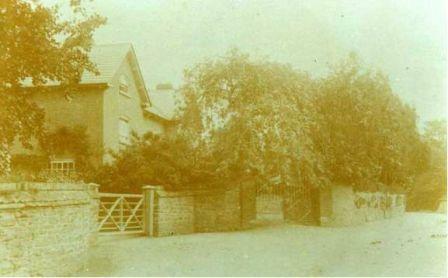 In these early years of the new century the Foleys of Stoke Edith were busy with their own house and gardens. The old mansion of the Lingens (presumably of Elizabethan or Jacobean date) was replaced by a gracious William and Mary one and the gardens laid out. It must have been at about this time (let us say in the decade 1740 – 50) that The Vine acquired a new tenant, and the Foley family a new Steward. This was John Edwards (whom we shall call John Edwards II, since his probable father (John Edwards I) and probable son (John Edwards III) also come into the story). We can approximately fix this date as, when John Edwards II died in 1803, the Parish Register refers to him as “steward to the Foley family above half a century”. It is possible that John Edwards II was born in Tarrington. Certainly a John Edwards, son of another John (whom we will call John Edwards I) and Mary his wife, was baptized in the Parish Church in 1720. His father John (John I) may have been the John Edwards born to William and Anne Edwards and baptized in 1689. However, there was more than one Edwards family in the village (and Edwards is a common enough name) so these and the identifications which follow are only plausible guesses and cannot be regarded as certain. In 1745 a John Edwards married Mary Ames – and would certainly be the right age to be that born in 1720. In 1746, a daughter Hannah was born to this couple, in 1748 a son Francis, in 1751 another daughter, Mary (though see below for a doubt about Mary’s date of birth), and in 1754 another daughter, Susannah. In 1758 a son, John, born to a John and Mary Edwards, was baptized on 31 December of that year in Tarrington Church. One is tempted to assume that the parents were again our married couple of 1745 (in which case the son of 1758 would be John Edwards III). However, we will see that John Edwards III’s age at death (in 1823) is given on his memorial in Tarrington Church as 61 – thus he would have been born in 1762 or thereabouts. In fact, on 25 October of 1758, the Parish Register refers to the death of one John Edwards. As we will see, this is not likely to be John Edwards II, cannot of course be the John baptized in December of that year, may alternatively be John Edwards I – or may be another John from another branch of the family in the village. In any event, the Parish Register tells us that further children came to John and Mary Edwards – Anne in 1763 and Sarah in 1766. These are all the children of John II and Mary whose birth can be traced from the Parish Register but 3 more can be identified from other sources. When John Edwards II came to make his will in 1792 (which we will look at further below) he referred to two further sons, Moses and Roger. Moses plays an interesting part in the history of the house after the Edwards period of occupation. When these two sons were born we cannot say. As they (together with John Edwards III) are the only children of John II mentioned in his will, one may suppose the others to have died (unless, especially in the case of the girls, the testator regarded them as sufficiently provided for already), in which case Moses and Roger may have been the youngest. In any event, by 1793 Moses was living at The Bowers, Holme Lacy, and is described as “gent” in a conveyance dated 30/31 January of that year. Further deeds have him still living in Holme Lacy till 1812 at least. The last child that we can identify is Elizabeth whom, as we will see below, the Parish Register records as having married in 1781 and who died in 1793. She may therefore have been born around 1760. Why the births of these three children are not recorded in the Parish Register is not clear – perhaps they were born out of the Parish. As we have seen, John Edwards II (who it seems not unreasonable to identify with the individual who married Mary in 1745 and fathered the children enumerated above) became Steward to the Foleys and (presumably) then moved into The Vine at some time between 1740 and 1750. This again fits with a marriage and the production of a family from 1745 onwards – as a prudent young man would not take such a costly step until his future was secure. The first documentary reference to John Edwards II at The Vine though is not until 1771. From that year there survives an Account Book with “Vine Farm 1771-1801” on the spine. Inside the cover is written “Vine Farm, Receipts and Payments from Candlemas 1771 for the use of John Edwards”. From the entries in this Account Book a picture emerges of the activities on Vine Farm during these years of the Wars of American Independence and then the French Revolutionary and Napoleonic Wars, which, because of the high price of corn, was such a golden age for farming in this country. For example, under the year 1772 there are many references to the farm’s hops, haymaking, weeding (carried out by one Ann Hodges), orchards, cows, bacon pigs, wheat and beans. In July 1772 there are recorded payments to James Godsall and regular payments to William Hodges for work on the hedges. For 1771 there is a record of the beans threshed and in 1772 of the calves dropped. On 14 April 1778 is recorded a payment to James Godsall for work on the ditch bottom of Vine Knapp. It is interesting to see this early a reference to the lane that used to run from the present drive dividing the house from Vine Cottage down to the line of the A 438. The Harvest on Vine Farm in 1781 began on 8 August. 31 men were listed as working (including John Hodges and the doughty James Godsall). For the year 1784 there exists a “Vine Labour Book” which records such activities, during that year, as bean setting, haymaking, reaping, hop pulling and apple picking. There also appears in the records for these years a Tax Assessment of 1786, when the occupier of the farm is given as Mr John Edwards, and its owner “The Devizes of the Late Lord Foley”. This latter is presumably Thomas, the 1st Lord Foley (the grandson of the Thomas who had bought the house in 1701), who had died in 1777. Thomas left his Stoke Edith estate (including the Tarrington properties of course) to his second son, the Hon. Edward Foley. In 1781 a survey was carried out of all the inhabitants of Tarrington – an early form of Census. The household of The Vine contained John Edwards, Elizabeth Edwards, and children John, Mary and Roger (the latter two being indicated as under 16). The servants were listed as James Corbett, Thomas Wall and Jane (no surname given). Also included in the household are John Godsall, James Godsall and Richard Hodges – all being under 16. Interestingly, listed for Little Tarrington are “John Edwards Snr”, Francis Edwards and Sarah Edwards. 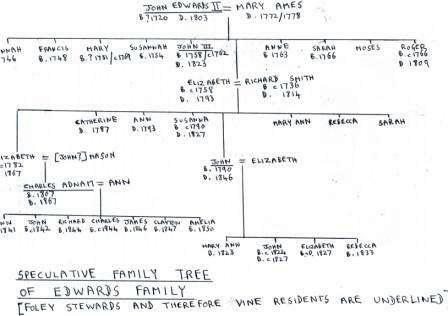 The Edwardses listed for The Vine are presumably John Edwards II, John Edwards III (if he had been born in 1762 he would be about 19 at this date) and the latter’s sister Mary. However, as the Mary listed in the survey is given as under 16, it may be that we are wrong to identify her with the Mary Edwards born in 1751. As we will see below, there was a further Mary Edwards born on or around 1769 (though not recorded in the Parish Register). She would of course be under 16 in 1781 and therefore may be the daughter of John Edwards II. Elizabeth and Roger Edwards would be the children of John Edwards II and Mary not attested in the Parish Register referred to above. The Edwardses at Little Tarrington would then be John Edwards I and his (presumably) grand-children Francis (born 1748) and Sarah (born 1766). John Edwards I would have been a good age by this time – especially if he is the John Edwards who was born to William and Anne Edwards in 1689. In fact, the Parish Register records the burial in this same year 1781 of a John Edwards, and this may be John Edwards I. The fact that there is no reference in the 1781 survey to the wife of John Edwards II, Mary, may be explained by the entry in the Parish Register for 1772 that a Mary Edwards was buried in this year. In fact, the year 1778 has a similar entry. As we have seen, this is not likely to be Mary, the daughter of John Edwards II and Mary his wife (as she seems to have been still alive at the time of the survey of 1781) so presumably belonged to another branch of the family – unless of course it was John Edwards II’s Mary who died in this year and another Mary in 1772. When the survey of 1781 recorded the presence of Elizabeth Edwards at The Vine, this must have been towards her final days there – as the Parish Register records her marriage in this same year to Richard Smith of Brinsop. Sadly, in 1793 the Register also records the burial of “Elizabeth Smith dau: of Mr Edwards”. However, in the 12 years of her marriage to Richard Smith, Elizabeth produced 8 children whom we can trace. These are Catherine, Ann, Elizabeth, Mary Ann, Rebecca, Susanna, John and Sarah. As we shall see, Elizabeth died in 1867 aged 85 and therefore would have been born around 1782 (perhaps the first-born and therefore named after her mother), John’s age in the 1841 Census is given as 51 and therefore he will have been born around 1790, and Susanna died in 1827 aged 37 and would therefore also have been born around 1790 (perhaps a twin of John). Catherine and Ann died young – in 1787 and 1793 respectively (these deaths from the Parish Registry). Of the births or deaths of Mary Ann, Rebecca and Sarah we have no trace. We do not know where Richard and Elizabeth made their matrimonial home. It may however have been in Tarrington (and even at The Vine), since, as we have seen, the deaths of Catherine and Ann are recorded in the Parish Registry. On the same page, and for the same year, as the latter death is recorded is also recorded the burial of “Elizabeth Smith dau: of Mr. Edwards”. It may be therefore that Elizabeth died in childbirth with Ann – or from complications arising from the same. One must hope that Elizabeth and Richard’s short marriage was happier than these stark references in the Register. who died in London, March 9 1827 aged 37 years. Of the remaining children of Richard and Elizabeth, the future lives of both Elizabeth and John have some bearing on the house. At some stage before 1807 Elizabeth married a Mr Mason (his Christian name is unknown but, as we shall see, his son, Charles, gave his own eldest son the name John – and his second son his own name Charles – as thus John is a reasonable guess) and gave birth to a son, Charles Adnam Mason. Charles was born in London to which Elizabeth, like her sister Susanna, appears to have moved. Of Charles Adnam Mason we will have much to say later. John Smith married a lady called Elizabeth and moved to Holme Lacy, where his wife gave birth to three daughters, Mary Ann (in 1823), Elizabeth (who died less than a year old in 1827), and Rebecca, born in 1833 (all these names of course being those of John’s sisters). A son John was born around 1824 but he sadly died at only 3 years of age. It is interesting that these children of John Smith were born at The Bowers in Holme Lacy, which, as we have seen, was the home of Moses Edwards, at least from 1793 to 1812. Mary Ann was born there in 1823 so by this date at least the Smiths must have moved in – and presumably Moses moved on to his next house, Tidnor Court, where, as we shall see, we find him at the time of the 1841 Census. In any event, as we shall see, John Smith did not stay at The Bowers long after 1823 and we will have more to say of him in due course. October of that year. The tombstone gives her age as 35. She would thus have been born in 1758 or thereabouts, which squares with her being the Elizabeth who was over 16 at the date of the 1781 survey. Her birth in 1758 is also a reason why the John Edwards born in that year (see above) is not likely to have been her brother – if they had been twins, her name also would surely have been mentioned in the Parish Register. In any event, Elizabeth’s husband Richard Smith lived on till 1814.He died on 25 July of that year, aged 78, and was buried with his wife in the Edwards’ family tomb. It should be mentioned that the Edwards’ family tomb also records the death on 23 December 1784 of another Elizabeth Edwards, aged 58. This may be an unmarried sister of John Edwards II. Also of one Richard Edwards, who died on 26 June 1798, aged 37. He may be an otherwise unattested son of John Edwards II. Thirdly of a Mary Edwards who died on 23 November 1800, aged 31 (ie born on or around 1769). Although this birth is not recorded in the Parish Register, it may well be (as mentioned above) that this Mary is the daughter of John Edwards II and Mary his wife, rather than the Mary born to the couple of that name and baptized in 1751. In 1793 the Hon. Edward Foley engaged the famous landscaper Humphrey Repton to landscape the park at Stoke Edith – and it seems to have been on his advice that the old King’s Highway, running from Stoke Edith past The Vine and up to the Church, was diverted to the present line of the A 438 (see “Notes” page 9) – though there the date of Repton’s visit is given as 1740: this must be incorrect as Repton was only born in 1752 and apparently his “Red Book” for the landscape design is still in the possession of the Foley family and is dated 1793). It is just possible that the hand of Humphrey Repton can also be traced at The Vine. Scots Pines were a favourite tree of Repton’s and a large Scots Pine of some antiquity is prominently planted in the garden of The Vine close to the old road. On the other hand, Scots Pines were apparently very fashionable in larger gardens or parks in the County through to the 1870s and our specimen may have been planted at any time during that period. In these closing years of the 18th century for the first time we have some evidence of the appearance and ground plan of The Vine and its surrounding farm buildings. There is a large scale map of the “Tarrington Division of the Property of the Hon. Edward Foley” dated 1777-8 – obviously commissioned by Edward upon coming into his inheritance in the former year. 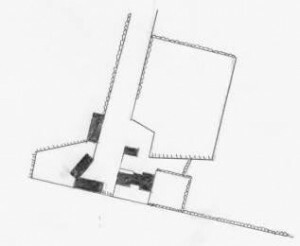 A sketch of that part of the map showing The Vine and its outbuildings appears as Map 2. Interestingly the plan of The Vine shows its configuration very much as now – as a stunted H with two shallow wings protruding front and back. To the rear or North of the house is the Cider Barn (which is indeed dated to the 18th century). Immediately to the West is the lane Vine Knapp, leading down to the present line of the A 438. To the West of this is a group of three long barn-like structures, one of which fronts the old King’s Highway (where the subsequent Estate Drawing Office – now Vine Cottage and Heritage Cottage – was to be) and the other two face lengthwise onto Vine Knapp. It is slightly strange that the old barn (now known as Vine Barn and Vine End) is not shown on the map in its present position as it is thought also to be of 18th century date. The map also marks the disposition of the gardens and fields surrounding the house and it is interesting that the form of the present front and side gardens are almost exactly as those marked on the map. To the rear of the house, however, all was given over to the needs of farming it seems. A large farm yard extended between the house and the Cider Barn and opened into a large field, much of which is the present Paddock The present boundaries of the Paddock, however, seem largely to conform to the map. As regards the physical appearance of the house, we have another very valuable record from this time. At some time in the late 18th century the Foley family commissioned a series of decorated plates showing the more picturesque of their various properties. One of these is a view of The Vine, seen from the South, with an imaginary view-point just the other side of the old King’s Highway. (A copy of this plate, with the picture expertly copied by Margie Bradstock of Freetown Farm, Little Tarrington, at present hangs in The Vine and is shown in Plate 5). The plate shows the South face of the house much as it presently is – ie a Georgian facade with two shallow projecting wings. The disposition of the windows in those wings is exactly as at present, though in the face between the wings only one, fairly wide, window is shown on each of the two floors, with a door to the right of the lower window. Certainly the door and ground floor window were in that position until the present owners moved in and replaced them with twin French windows, but the one window on the first floor must have been replaced by two at some stage between the time the plate was painted and the beginning of the 20th century (when we have a photograph showing two) – unless the plate has simplified the arrangement. At some time, therefore, in the 18th century the Foley family had carried out a fairly substantial alteration to the house – to turn it from its (maybe stone, maybe half-timbered but probably pretty undistinguished) former state into a “gentrified” Georgian mansion. As we have seen, substantial work was being carried out to modernize the Foley’s Stoke Edith mansion house, and landscape its gardens, in the early years of the century and this may have been a convenient time for the same to be done (on a much more modest scale of course) for The Vine. Of course, it is just possible that the modernization of the house was carried out by William Hopkins before his death, or even by his widow Mary with her second husband, but the extent of the work and its cost must have been quite considerable and it is more likely to have been initiated by those with the resources of the Foley family – and their ability to economise on the costs by combining the work with that being carried out to their own mansion. It may be from the time of this alteration to the house that the room in the Western of the two new wings became the Steward’s Office – where the Estate tenants came to pay their rents and discuss business. This has a separate entrance and porch, so that such business visitors had no cause to enter any part of the rest of the house. It also, till quite recently, housed a metal safe, sunk into the wall. Its immediate proximity to what then or later was the Estate Office (now Vine Cottage and Heritage Cottage) was also useful. The Foley plate is also interesting in that it seems to confirm that the rather quaint old stone gate with heavy timber door and elaborate metal work hinges, placed in the South boundary wall by the old King’s Highway, was not in position at the time the plate was painted. There is certainly a fairly substantial looking wooden door shown in that position on the plate but not, it seems, with the distinctive masonry surrounds. This is consistent with Prebendary Parker’s dating of the installation to 1844. In 1799 a further Tax assessment took place and this duly records John Edwards as occupier of Vine Farm – with John Poole at “Little Vine”, wherever that was. Land owned by the Foleys at Claston also seems to have been attached to the Vine Farm at this time – as in the Vine Farm Account Book is a slip of paper recording that (unspecified) work at Claston started on 25 April 1802. John Edwards II’s Account Book, giving us some valuable glimpses into the activities on Vine Farm in the last 30 years of the 18th century, ends as at 30 September 1802. As we have seen, John Edwards II died and was buried at Tarrington Church in 1803 – the Parish Register recording him to have been “steward to the Foley family above half a century”. 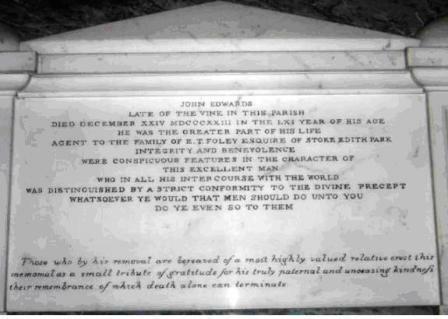 He was laid in the Edwards’ family tomb in the Churchyard, which records his date of death as 22 January 1803. His age as given on the tombstone is 77 – which would make him born in 1726 or thereabouts. We have so far identified John Edwards II with the son of John and Mary Edwards born in 1720. This identification may therefore be wrong – though alternatively the tombstone may be in error. It has always to be born in mind that the recording of births, ages at death etc was still not an exact science at this time. John Edwards II had prudently made his Will a good ten years before his death – it is dated 25 November 1792 (and was proved on 28 Sept 1804). Only 3 of his (at least) 10 children are mentioned in it. Moses, Roger and John all receive legacies, as do 6 of his grandchildren from the marriage of his daughter Elizabeth to Richard Smith – Elizabeth, Mary Ann, Rebecca, Susanna, John and Sarah. There is finally a legacy to his housekeeper Hannah Hatton. It seems however, that John Edwards II’s death caused little disruption to life at The Vine. The Tax Assessments for 1803 and 1804 still give “John Edwards” as the house’s occupier, as do all the Assessments up to and including 1823. We must conclude from this that John Edwards III (by now a middle-aged man of 41 or thereabouts) was appointed by the Foley family to replace his father and live at The Vine. On 19 May 1809, John Edwards III’s brother Roger died. He was buried in the family vault. His age is given as 43 – which would have made him under 16 at the time of the 1781 Assessment and therefore suggests that we may be correct in identifying him with the Roger mentioned there. Another set of extant Account Books take us into the 19th century. A “Vine Farm Accounts” book commences Michaelmas 1805. One entitled “Farming Accounts” starts from 1 January 1808. There is a Grain Account Book for 1809, and a “Labour Grain Account” commencing on 2 February 1812. Despite its title, this Account also includes details of cows calved, barley threshed and hops-picked as well as wheat sold. It records, for example, that the 1815 wheat harvest begun on 14 August, occupying 12 men and hop-picking on 1 September, with 23 persons employed. The last of John Edwards III’s Account Books we have are a Grain Account for 1816 and a Cattle Grain Account, commencing on 1 September 1819 – though, as we shall see, John Edwards III was to continue as Steward at The Vine for another few years. There were further Tax Assessments yearly from 1807-9 and from1811-18. All these confirm John Edwards as occupier of The Vine. Those for 1816, 17 and 18 refer to “J.Edwards Esq.” and it is interesting that John Edwards should be entitled to this (at that date) quite distinguished appellation, despite not of course being the owner of the land he farmed. One must suppose that being the Steward of the Foleys carried with it some social distinction. In 1818 a long-serving member of The Vine household died. She was Hannah Hatton, who was buried at Tarrington Church on 28 January of that year, aged 77. The Parish Register records “House keeper at Mr Edwards’s at the Vine upwards of thirty Years”. She presumably joined the household shortly after the survey of 1781, as she is not mentioned there.We have seen that she received a legacy in the Will of John Edwards II who clearly regarded her as a valuable member of the Vine household. On 7 May 1821, John Edwards III made his will. We know this as he left a bequest of £200 to finance a Sunday School teacher for the Parish and this gift is included in a list of “Donations to the Parish of Tarrington” recorded on a fine painted wooden board from that time set up high on the wall of the Vestry in the Church. their remembrance of which death alone can terminate. Interestingly, John Edwards III’s age at death as given on the Edwards’ family tomb is 51. We must presume that this is a mason’s error. It would put him born in 1772, and he would have been under 16 in 1781, when the survey for that year shows him as over that age. Also, we are assuming that his mother Mary died in 1772 (although, as we have seen, perhaps 1778) – she could have died in childbirth of course but it would be unusual for her death, and not John’s birth, to be recorded in the Parish Register for this year. Finally, assuming Mary had married John Edwards II in 1745 (and assuming her age then was about 25), she would have been 52 in 1772, a remarkable age to give birth. The new incumbent at The Vine (and therefore it is to be assumed the next Steward to the Foley Estate to replace John Edwards III) is most interesting for it appears that, after two generations of the Edwards family, the Foleys were quite happy to continue in that line and appointed John Smith, the son of Elizabeth and Richard Smith and John Edwards III’s nephew, to that office. As we have seen, John was born around 1790 and would thus be around 34 in 1824. As we have also seen, by 1823 he was living with his family at The Bowers, Holme Lacy, the former home of his uncle Moses Edwards. Perhaps he had been already assisting his other uncle John Edwards in the running of the Foley Estate so as to give the Foleys confidence in his ability to assume his uncle’s duties on the latter’s death. Accordingly, the next Tax Assessment we have, for 1824, refers to John Smith at Vine Farm (and Henry Poole now at Little Vine). The 1825 Assessment refers to John S. Edwards there and the 1827 to 1830 Assessments to John Smith Edwards. Quite when John Smith added Edwards to his name we do not know. In the birth certificate of his daughter Mary Ann in 1823 he is referred to as John Smith Edwards (and also in the Will of his sister Susanna of 20 November 1826) so clearly he had done so by that date. We also do not know whether John’s taking of the extra surname was due to some formal adoption by John Edwards III (or even Moses Edwards) or a less formal change of name. Unusually for the time, it appears that John Edwards III never married (at least we cannot trace this in the Parish records). The memorial plaque in the Church is stated to have been erected by “relatives” only – and although it does refer to his “paternal” kindness, this may be figurative. Quite how long John Smith Edwards continued at The Vine is not clear. As we will see, by 1838 there was a new occupier, and Steward to the Foley Estate, at the house. It is possible that the reason for John Smith Edwards’s move away from the house is connected with the death of Moses Edwards, by now John Edwards II’s sole surviving son. His Will, made on 31 January 1835, has him resident at Tidnor, Lugwardine. In the Will he leaves legacies to his nephew John Smith Edwards and also to his great nephew Charles Mason (whom we have seen was the son of John Smith Edwards’s sister Elizabeth and John (?) Mason ). By the time of the 1841 Census, John Smith Edwards is himself living at Tidnor Court in Lugwardine, with his wife Elizabeth and daughter Mary Ann. Thus it seems likely that John Smith Edwards inherited, or purchased, Moses Edwards’s property at Tidnor some time between 1835 and 1841 and moved there from The Vine with his family (it will be remembered that John Smith Edwards had also followed Moses in the occupation of The Bowers in Holme Lacy before the move to The Vine). In any event, he died at Tidnor on 21 February 1846. The reader will probably by now be relieved to learn that we have finished with the tortuous (and all too speculative) genealogy of the Edwards family! We should repeat that a fair amount of guess-work has been involved in trying to reconstruct the family tree of the Edwards’ during the 18th and early 19th centuries. Almost certainly some confusion with other branches of the family and some misattributions have occurred – but at least the figures of John Edwards II and III appear reasonably clearly. “The above Mary Gwillym died suddenly at the Vine in this Parish – she dropped down instantly and was not able to utter a word”. Before moving on the next recorded Foley Steward at The Vine, it should be mentioned that, in the Stoke Edith Estate Office there hangs a very fine portrait of one John Maule, described on the frame as “Steward”. His dress, hair-style etc put the date to the last years of the 18th and first of the 19th centuries. As we have seen, there is fairly good evidence that the Stewardship of the Stoke Edith Estate was continuously in the hands of the Edwards family at this time. It is possible therefore that John Maule held another Foley Stewardship – perhaps on the Malvern, Whitley or Prestwood Estates of the family.